New digital technologies are transforming how students engage in learning in various contexts. Researchers are examining the ways in which digital tools cultivate critical thinking and collaboration while bolstering opportunities to develop both content knowledge and technical skills (Simkins & Schultz, 2010; Stephens, Lehr, Thorp, Ewing, & Hicks, 2005; Tiene & Luft, 2001; Windschitl & Sahl, 2002). An investigation of the generative relationship between new technologies and learning is particularly important in literacy classrooms, where new digital tools necessitate distinctive combinations and interpretations of literacy practices that integrate myriad cognitive processes and sociocultural practices (Elkins & Luke, 1999, p.213). 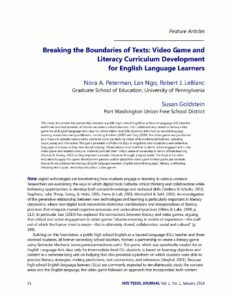 In particular, Gee (2010) has explored the connections between literacy and video games, arguing that critical and active engagement in video games ‘situates meaning in worlds of experience—the stuff out of which the human mind is made—that is ultimately shared, collaborative, social and cultural’ (p.189). Building on this foundation, a public high school English as a Second Language (ESL) teacher and three doctoral students, all former secondary school teachers, formed a partnership to create a literacy game using Gamestar Mechanic (www.gamestarmechanic.com). The game, which was specifically created for an English Language Arts class only for intermediate-level ESL students, is based on learning objectives and content in a semester-long unit on bullying that also provided a platform on which students were able to practice literacy strategies: making predictions, text connections, and inferences (Singhal, 2001). Because high school English language learners (ELLs) are commonly expected to simultaneously study the content areas and the English language, the video game followed an approach that incorporated both content and language objectives by focusing on the subject of bullying and literacy strategies (e.g., Echevarria, Vogt, & Short, 2007; Schleppegrell, 2004). Informed by second language learning researchers and practitioners, including Krashen (1989) and Cary (2000), the video game was positioned as a means to provide various entry points to curricular texts using its multimodal features, including visual, aural, and interactive. The game provided scaffolds for ELLs to negotiate new vocabulary and unfamiliar language structures as they read about bullying. The high school ELLs in the focal classroom context played the game as part of their learning unit, after which the ESL teacher and her students shared their reflections and critiques of the video game. Observations show that the students’ active engagement in the video game and related curricular material provided them with a sense of ownership in terms of their learning(Norton & Toohey, 2012) as they explored authentic literature through a digital world. The hope is for other educators to apply this game development process and/or adapt the video game to their particular contexts.